Posted: January 24, 2019 Updated: January 24, 2019 by onlineph | Filed under Business, Government, Public Service, Travel. 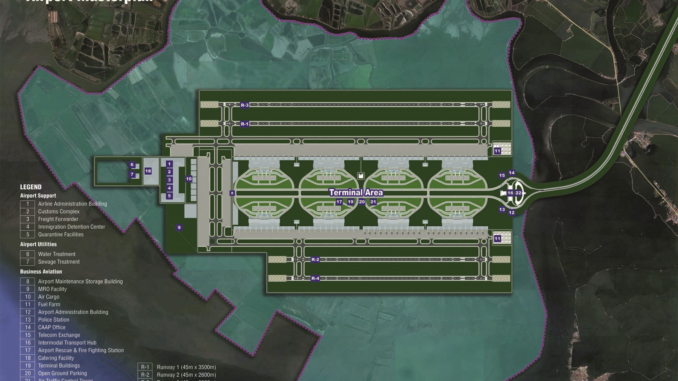 The highly-anticipated New Manila International Airport in Bulacan is now one phase ahead from realization as San Miguel Corporation (SMC) President Ramon Ang announced that the project will break ground this year. Last December 24, the National Economic Development Authority (NEDA) authorized the negotiation results of the project’s Concession Agreement (CA) between the Department of Transportation (DOTr) and San Miguel Holding Corporation (SMHC). The proposed Bulacan International Airport is an unsolicited public-private partnership (PPP) proposition from SMHC. The diversified conglomerate will construct, operate and maintain the proposed airport on a 2,500-hectare land in Bulakan, Bulacan. The revised CA will now undergo the final review by the Office of the Solicitor-General and the Department of Finance before it is endorsed to other parties for a Swiss Challenge. In this process, third parties will be invited to bid to match or better the proposal. Under the original proposal, SMHC will shoulder the total project cost of Php 735.63 billion on its own through an unsolicited build-operate-transfer agreement. The government will not provide any guarantee or subsidy for the project. SMC reiterated that company’s excellent track record, “strong balance sheet, consistent profitability, and sustained growth and liquidity” will make the ‘world-class’ airport possible. Ang expressed confidence over SMHC completely backed up by its parent company in terms of financial capability. The construction of the airport is estimated to cost $15 billion and projected to be completed over a period of five to seven years. The Bulacan International Airport will have four parallel runways which can be extended to six and will be equipped with state-of-the-art and world class facilities. 100 million passengers annually will be serviced by the airport, a huge improvement in comparison to the 31 million passengers accommodated by NAIA every year. RELATED: Philippine passport now 10 years to expire. “It will create some one million jobs once construction starts, and by the time it’s completed, millions more of new tourism jobs will be created,” Ang said in a statement. “Travel will be much easier and more comfortable for our air passengers, for overseas Filipino workers, and foreign tourists. Access will also be very easy with multiple expressways that will bring the airport within 30 minutes or shorter from anywhere in Metro Manila,” he added.